Fits with many decors, washes beautifully and is constructed well. It is very soft and is comfortable to sleep under. Looks very expensive. Order it you will be happy. Sweet and bright, this Siscovers Polka Dot Poppies six piece duvet cover set will add freshness and color to your bedroom. The digitally printed pattern shows the beauty of an original watercolor masterpiece. 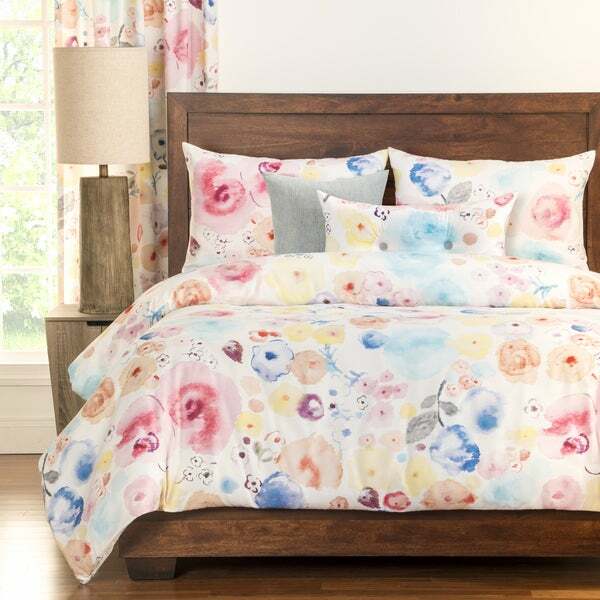 The fashionable set features one duvet cover, one comforter, two toss pillows, and two pillow shams (single sham only included in the twin set). The ultra soft feel and cozy, eco-friendly down alternative comforter fill make this set as comfortable as it is attractive. The duvet cover and shams have zippered closures for easy cleaning. Eight buttons firmly secure the comforter inside the duvet cover. This easy to maintain set is also machine washable. Unique and bright, this vibrant comforter set is the perfect way to enliven your room. LOVE this set, it is even prettier in person!!! Just as good as the last set I love these! The colors are universal to many room colors. Great reviews clinched my decision.